In press, available from the SPIE, the International Society For Optical Engineering (don’t ask me). 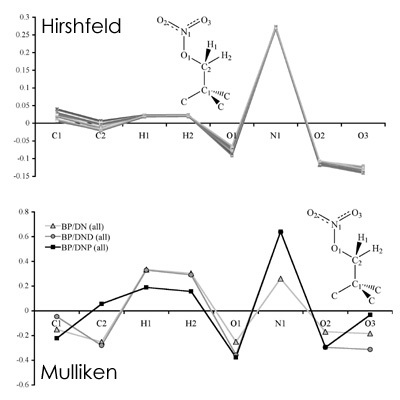 One of the most interesting pieces of information to come from this study, besides discovering the SPIE’s restriction to grey scale images in this day and age, is just how insensitive to basis set the Hirshfeld partitioning method is (across the DN, DND, DNP DMol3 basis sets) and just how sensitive the Mulliken partitioning method is. This is, of course, not new to quantum chemistry, but it is of interest to note that the same basic trends that apply to Gaussian-type basis sets also apply to numerical basis sets (trends, interpretive limitations, what’s the difference?). The plot below shows the relative charges on each symmetry-unique atom in PETN. These trends have significant impacts on the calculation of THz intensities by difference-dipole methods, as is discussed in detail in this article text (I have glossed over quite a bit of analysis and report the charge findings for purely academic reasons). Abstract: This paper focuses on the establishment of methodologies for the successful application of first principles theoretical analyses in the understanding of the terahertz spectroscopy of molecular solids, particularly high-energy materials. A solid-state density functional theoretical study has been performed on the high explosive pentaerythritol tetranitrate (PETN) in order to address the relationships between the choice of computational parameters and the predictions of molecular and solid-state properties, such as molecular geometries, intermolecular interactions within the crystal cell, charge distributions, and solid-state vibrations in the terahertz (3 to 200 cm-1) region. This investigation has lead to the conclusion that the BP functional has the best overall performance and the choice of basis set is the most critical theoretical variable. Varying other parameters such as grid size, orbital cut-off, and convergence criteria lead to negligible differences among the calculations.